Our Baby is Hearing Impaired: What Do We Do? Where Do We Start? This paper assumes that it is now confirmed that your baby has a hearing loss. 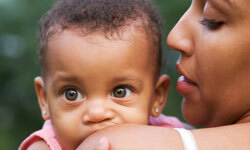 Each year in the US 11,000 babies are born with hearing loss, so you are not alone. Fortunately today hearing loss is a treatable condition. All parents want a perfect child, a child that is just like them. Discovering your child has a hearing loss does not make an imperfect child. You have a prefect child that has a challenge that can be overcome. Nevertheless, discovering your child's hearing loss is a shock that typically sets off a series of emotions that must be worked through to allow you as parents to become effective in giving your child a normal life. Let's start with a discussion of your feelings and emotions about your child's hearing loss. It is always a shock to have it confirmed that your child has a hearing problem. Questions such as: "Will our baby learn to talk? Will he/she be able to go to school? Can she/he be fitted with hearing aids or a cochlear implant and hear like we do," race through your minds. The answers to these questions will be forthcoming, but it will take time. It is a very common first reaction to any shocking news is to say, "NO this can't be". Usually this reaction is brief and the reality of the situation is accepted. If, however, this feeling is prolonged it can inhibit your working with your child. The loss you are feeling is real. It sets up a very natural grieving process that progress through periods of denial, anger, guilt, depression, fear, anxiety and sadness. Grieving is a natural and healing process. Some parents go through this in a few days, for others it may be very prolonged. The flip side of sadness is anger and these feelings may alternate. Anger leads to a search for someone to blame. You can always find someone to blame. Discuss your anger with family and get it resolved. Ideally this anger will subside as reason prevails. The need now is to get on with helping your child. Sadness over the hearing loss may be life long, but anger is destructive. Guilt is often the most difficult long lasting emotion that you as parents have to deal with. Mother may feel guilty for smoking or drinking during the pregnancy, or father may feel guilty for exposing his pregnant wife to second-hand smoke or not encouraging the right kind of diet. Be careful not to magnify this guilt by blame. What is "is", forgive and move on. Your child needs you. If you cannot resolve guilt, seek professional help. "In successful families, the behaviors stemming from the unpleasant feelings present in the initial stages of the grief process are reframed and transformed into positive action. The transformation occurs as the family gains confidence and as the professional listens sensitively in a positive, affirming manner. Thus, the anger is transformed into an energy that can work for your child, the guilt becomes commitment, the feeling of inadequacy and confusion becomes the impetus to learn, and the feeling of vulnerability initiates a restructuring of priorities". Take whatever time is needed to work through the acceptance and transformation of your feelings about your child's hearing loss. Until this is accomplished you will not be able to help your child. The following paper is to give you, the parents, information about where to start and to help you develop a plan for your child's first 3 years. You have been referred to an otology/audiology center by your pediatrician. Otologists are physicians who specialize in ear problems, have experience with infant hearing management and are qualified to surgically place cochlear implants. The otologists first function is take a history emphasizing any history of hearing loss in your families and examine your child to confirm that the ear canal and middle ear are normal and that the hearing loss is due to a problem in the inner ear called sensorineural hearing loss. In addition your otologist will order Magnetic Resonance Imaging (MRI) to check for any abnormalities of the cochlea. Further diagnostic tests may include blood sugar, thyroid, VDRL, and TORCH, (Torch is an acronym for infectious agents known to cause congenital deafness i.e. Toxoplasmosis, Rubella, Cytomegalovirus, and Herpes virus). Be sure you get a copy of these studies as they may be needed for other professional consultations. Each otologist works closely with an audiologist who has a master's degree in hearing science and has spent an additional clinical practice year to get a CCC. Degree (Certificate of Clinical Competence). They are qualified in hearing testing and fitting hearing aids in adults and children. There is a prevailing feeling that when infant hearing loss is discovered in the first weeks of life, hearing aids must be fitted immediately. The early days after your child's birth is a difficult time because labor and child birth take a tremendous toll, and the mother is usually exhausted, sore, and emotionally fragile from the extreme hormone swings in the aftermath of the birth. For these reasons this is not a good time for the distraction and expense of fitting of hearing aids. It is preferable to delay hearing aid fitting until the child is 4 to 6 months old. During this time you can come to grips with the initial shock, accept your babies hearing loss, love and enjoy your new baby and become knowledgeable about infant hearing loss management. During these first 4 months hearing impaired children and normal hearing children will develop movement, vision, crying and some attention to sound. (Northern and Downs1984). The vocal system is developing. Anatomical, physiological, and neurological changes, such as increase of the oral cavity, lowering of the larynx, prolongation of the vocal tract, and nerve myelination result in greater maneuverability of the tongue and other speech organs thus enabling the infants to produce a greater variety of sounds. (Kishon-Rabin 2006). You may be quite satisfied with the otologist/audiologist your pediatrician has referred you to. However, during your child's first 4 months you should take the time to interview and evaluate hearing health teams. When you visit an otology/audiology center ask if in their practice they see many infants and toddlers with hearing loss. During these first months keep in mind that you the parents are the most important members of the team that will guide the hearing care of your child. This may sound odd, since the professional team members' deal with many children, and have much greater experience; but they will come and go. However, ultimately it is you the parents-not the professionals-who have responsibility for your child and who will make all the important decisions concerning him/her until adulthood. Each professional that gives you advice should fully explain and be sure you know the reasoning for the advice. Communication based on hearing is called oral communication. Communication based on vision (sign language)is called manual communication. In recent years because of advances in hearing aids and cochlear implants many "oral education schools" have developed throughout the United States and the World. To find out more about oral schools go to www.oraldeafed.org web site. Oral schools for hearing impaired children are listed on this web site by US areas. Click on the name of a school in your geographic area and the school web site will come up. Also referenced are brochures and films about oral education and mainstreaming children in neighborhood schools. These materials are available free. Visit one or two oral deaf schools in your area. The school principal and/or the parents should be able to give you the name of an otologist/audiologist center that is knowledgeable about infant hearing loss diagnosis, treatment, and management. An interesting web site "Tucker Maxon in Oregon" shows a hearing impaired child who has a cochlear implant interacting with normally hearing children. Also check with your school district about the programs they have for hearing impaired children in the neighborhood schools close to your home. Find out about their early intervention and preschool programs. Another excellent source of information and help in establishing management of your child's hearing loss is the Alexander Graham Bell Association for the Deaf and Hard of Hearing. Their website is: www.AGBell.org. There is a parents section that advocates independence through listening and talking with special emphasis on supporting families of children with hearing loss. The oral school can help you enroll in an "Early Intervention Program". These programs usually start when the diagnosis is confirmed. Many schools have these programs that feature a teacher of the deaf who meets on a regular basis with the parent(s) and child. These meetings will give you the knowledge and training to develop and strengthen the confidence you need to nurture a hearing-impaired child. The following is a description of the Early Intervention Program pioneered by The Tucker Maxon School in Portland Oregon (Fortier 2006). How to care for and manage hearing aids and cochlear implants. How to ensure the hearing technology is functioning properly. What to expect from a child using hearing aids or a cochlear implant. Individual Parent Child therapy, birth to 3 years of age, in the natural home environment and/or in a school based setting. Pediatric audiological services including comprehensive amplification and cochlear implant management and support. Diagnostic assessment of language, audition, speech, social,-motor, adaptive skills, and cognition. Parent group support and networking. Toddler play group with age-appropriate hearing peers. Achievement of adequate language skills. Establishment of sound mental health. "Our goal is to produce adults who can thrive in the conventional "hearing world". A child needs to spend her learning years with exposure to the typical sounds and behaviors of the hearing world. The communication - and the noise - of playgrounds and classroom filled with hearing children is invaluable for developing understanding of norms in the hearing world". "Our view, then, is that the majority of hearing-impaired children, given hearing aids [or cochlear implants] that provide them with optimal gain for the detection of sound and adequate practice in arriving at meaning of spoken language, will learn most of the auditory discrimination and identification skills that are possible for them without formal training on discrimination tasks". Another important resource associated with schools are the parent-to parent groups composed of parents that are raising a hearing impaired child. Ask to join the group that is associated with the school you are interested in. Their first hand experience raising a hearing impaired child can be very valuable in guiding you in your baby's management. An important example of a program is described by Anita Bernstein(1993). "In recent years, parent-tot playgroups have become popular in the community at large, since they offer valuable support to parents and stimulating activities for the children. A parent of a hearing-impaired baby, whose special needs are particularly demanding, may benefit even more from such a program. Our playgroups, which meet once weekly for 1-½ hours provide a supportive environment for the immediate and extended family of the hearing-impaired baby or toddler. Parents, grandparents, siblings, babysitters, uncles, aunts, and close friends are encouraged to attend. In our experience, an optimal number of families for a playgroup seems to be about nine or ten. Traditionally, mothers have been expected to accept major responsibility for their hearing-impaired child's special program. Fathers are now more in evidence. It has been especially rewarding to see fathers, who initially tended to stand back and observe, become skilled at interacting playfully with their little ones. Some fathers and mothers have chosen to alternate participation at these sessions. When more than one family member is actively involved, the burden is eased. The playgroup provides a setting in which parents can share their triumphs and frustrations. Parents attending the program for a second year can offer their energy, experience, support, and encouragement to families with newly diagnosed babies. Parents' trade tips on ways of keeping hearing Processors on small ears, encouraging toddlers to stay in their beds at night, or locating second-hand toys. 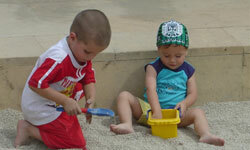 The playgroup provides many opportunities for guiding interaction between parent and toddler. The activities and toys for each session are selected to reinforce the language being emphasized in individual guidance sessions. During the playgroup, parents explore ways to encourage their babies to listen and talk through play, music, and at snack time. School staff members are available to model play and language stimulation techniques. The babies have a chance to play with new toys, explore climbing equipment, and meet other babies. It is an excellent setting for informal exchange with various school professionals-teacher, social worker, occupational therapist, and principal. The original goals for the playgroup were to provide parents with additional support, contact with other families, as well as a "play and learn" program for the hearing-impaired babies. However, a number of unexpected benefits have become evident. 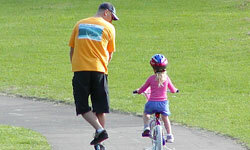 Parents have more quickly developed a support network and friendships with other families. Evening parent education meetings are better attended, as families find it easier to share their experiences and bring up problems when in the company of adults with whom they are comfortable. Discussions become more relevant and specific since they know each other's babies. Families become more involved in the school community". Fortunately your child's hearing impairment can be treated with hearing aids or cochlear implants. Hearing aids are designed to amplify sound to a level that will make it possible for your child to hear normal speech. Cochlear implants are entirely different in that an electrode is surgically implanted into the inner ear (the cochlea) and tiny electrical currents are generated that stimulate the nerve of hearing. Neither of these devices cures deafness, but they make it possible for your child to hear and develop speech and language. To help you understand the importance of early intervention the following quote from Dettman et al (2007) is presented. "Auditory percept, that is learning to listen, in hearing children as well as children with hearing loss is associated with the regular occurrence of speech events coupled with the features of attention, memory and meaning. If listening is not developed during the critical language learning years (6 months to age 4) a child's potential to use speech input is likely to deteriorate. (Sharma 2002) The key feature of the developing auditory system is plasticity which is present at 6 months and decreases with age. Evidence suggests that the myelination occurs early in life and enables stable neural connections to form so the memory and learning can develop. Starting at 6 months of age a hearing aid or at 12 to 24 months a cochlear implant gives your child a greater potential to benefit from these critical periods of neural development. "72 children whose treatment with hearing aids and appropriate educational intervention began at six months of age were compared with 78 children whose intervention began after a year of age. These two groups of children were followed past age three. Those with intervention began at six months of age have achieved a language quotient in the 85th percentile for language compared to normally hearing children. Those whose sensorineural hearing loss management started later than age six months have scores significantly below the early identified and managed children. These positive effects of early identification and treatment occurred regardless of cognitive delay or multiple handicaps, gender, level of parent education and financial status". There are many companies that make hearing aids. All hearing aids have the same function, namely making sounds louder. The manufacturers advertise special features but basically there is little difference in different brands of hearing aids. Your otologist/audiologist team will have their preference of the hearing aid manufacturer and will discuss this with you. The main thing now is to get the hearing aids fitted in both ears by age 6 or 8 months. To find out about hearing aids check www.childrenshearing.org. Information about sources of funding is found on this web site. Your audiologist will need to take ear canal impressions to fit post auricular aids. The hearing aids will take one or two weeks to arrive. During the first fitting session the audiologist will determine if your baby is reacting to sound. At home you will continue the process of determining the hearing aid gain by using the same Sleeping Baby Hearing Screen (SBHS) that your pediatrician or family doctor had you use when you first suspected your babies hearing loss. The goal is to determine if your baby can now be aroused at conversational level speech of 60 or 70 dB. If not increase the hearing aid volume gradually until the baby responds at 60 dB. The word gradually is emphasized because if your child is exposed to very loud painful sounds your child will reject the hearing aid. Ask your audiologist to demonstrate how to listen to your child's hearing aid with a stethoscope. Each time you increase the hearing aid volume listen to it while saying the Ling sounds to be sure the loudness increase is small. These studies can take up to several weeks. If the loudness has increased to the level that feedback (squealing) occurs and your child is still not arousing to the Ling sounds at 60 dB, a cochlear implant is the next step. The law specifies that hearing aids can be returned after a month trial for full refund. If your child responded at 90 dB or did not respond to any level of the Sleeping Baby Home Hearing Screen it will be necessary to proceed to a cochlear implant. It is recommended that implant surgery be delayed until between 8 and 18 months of age because the ear anatomy is more developed and the anesthetic risks are significantly less. Also the increased benefits of implanting between 6 and 12 months are low. Holt Svirsky (2008). . This delay will give you time to study cochlear implants in more detail. An excellent review of what cochlear implants are and how they work is available on the National Institute for Deafness and Communication Disorders web site: www.nidcd.nhi.gov. Your local oral school for the deaf can give you references to centers that are doing many children's implants. Visit one or two of these centers and ask your preferred center to evaluate your child and schedule surgery at the appropriate age for your child. Also for information about the William House Cochlear Implant go to the AllHear.com web site. The parent group is an important forum for discussing the many problems that have arisen because your child has been deaf for two or more years before getting the cochlear implant. Your child is now walking and in many ways all systems except hearing are functioning like a normal child. Deaf children often are very frustrated, have temper tantrums, and are difficult to discipline because of the parents being unable to communicate with them. They often have difficulty playing with other children because of aggressive pushing and fighting. The implant does not make them normal children. Now instead of being deaf children they are hearing impaired children. Over time the implant will make it possible to easily communicate with them. Frank discussion of these problems with other parents can often lead to solutions. The child with the congenital, hi-tone, ski-slope type loss is the last to be suspected of having a hearing problem. This child may not be referred to the otologist/audiologist and/or speech pathologist, because of abnormal speech patterns due to lack of high frequency consonant sounds until he is five or even six years of age. If the child has had newborn or infant hearing testing with Transient Oto Acoustic Emissions (TOAE) each ear will have been separately tested and a unilateral hearing loss discovered. On the other hand, if the child's hearing has been tested by the Sleeping Baby Home Hearing Screen, a unilateral hearing loss will not have been discovered in early infancy. Unilateral hearing loss will allow normal development of speech and language. But, if not discovered in the pre-school years, it can lead, during the grade school years, to increased failure in school requiring repeating of a grade and associated social and emotional difficulties. In the absence of testing, unilateral hearing loss is often discovered by the child not being able to hear the phone in one ear or difficulty locating the source of sounds. At age 3, children have developed enough speech and language to allow their hearing to be tested in a sound treated room and to respond to pure tone testing by placing a ring on a peg or blocks in a bucket. This conventional pure tone testing of 3 year olds will give considerably more audiologic information if either bilateral or unilateral hearing loss is present. Therefore, this should be a part of all pediatric evaluations in all 3 year olds. Once discovered, unilateral hearing loss can alert the parents to speak more directly to the child and be sure that the child is attending to the parent when being spoken to. Also, it helps in placing the child in the ideal situation in the school room for hearing. A hearing aid and CROS aids (contralateral routing of signal) can be tried but with limited success. The child with the congenital, hi-tone, ski-slope type loss will be discovered at the time of the 3rd year testing. If hearing testing at age 3 is not done, the child may be referred to the otologist/audiologist and/or speech pathologist because of abnormal speech patterns due to lack of high frequency consonant sounds. The child with unilateral hearing loss will develop normal speech and may not be discovered until five or six because he/she complains inability to hear the phone on the affected ear. The child with an acquired hearing loss due to meningitis or other illness is usually diagnosed shortly after the illness since the parents see the marked difference in response to sound. If it is obvious that the hearing loss is total, especially if it follows meningitis, a cochlear implant should be placed within a few weeks. Early placement of a cochlear implant facilitates the surgery because it is accomplished before ossification occurs in the cochlea. Bernstein A. (1993) A school based parent infant program: The first step in the education process. Volta Review Nov 1993;95(5):75 84. Holt RF, Svirsky MA, (1908), An exploratory look at pediatric cochlear implantation: Is earliest always best? Ear and Hearing Vol. 29, No. 4, 492-511. Karltorp A, Freijd E, Ostlund U, Johansson P, Rasmussen P, (2007) Is cochlear implantation before the age of one justified? ; 11th Internationals Conference on Cochlear Implants in Children. Charlotte, NC. Kishon-Rabin L, Taitelbaum-Swead R, Ezrati-Vinacour R. Hildesheimer M (2005): Prelexical vocalization in normal hearing and hearing-impaired infants before and after cochlear implantation and its relation to early auditory skills, Ear and Hearing, Supplement 0017S/O, pg 17S-28S. Ling D, Ling AH: (1989) Aural Habilitation; Alexander Graham Bell Association, Washington DC, 4th printing 1989, pg 185-186. Luterman D. Counseling parents of hearing-impaired children. Boston: Little Brown, first ed. 111. Mencher GT (1972) Screening infants for auditory deficits; U of Nebraska neonatal hearing project. Audiology (Suppl) 11:69hy. Mehl A, Thomson V, (1998) Newborn hearing screening: The great omission, Pediatrics, 101 (1) e4. Northern JL, Downs MP; (1984) Hearing in Children, 3rd ed. Lippincott, Williams & Wilkins.pg 141. Northern JL, Downs MP; (2002) Hearing in Children, 5th ed. Lippincott, Williams & Wilkins. Sharma A, et al (2002) A sensitive period for the development of the central auditory system in children with cochlear implants: Implications for age of implantation; Ear and Hearing Vol 23 No 5, pg 532-536. Yoshinga-Itano C, Sedey AL, Coulter DK, Mehl AL; (1998) Language of early and later identified children with hearing loss. Pediatrics, 102 (5), 1161-1171. To learn more about the Sleeping Baby Home Hearing Screen, please contact our office at 336-273-9932 and ask to speak to one of our Audiologists.